Will the sun power cars of the future? Last week in Alternative Cars Part 1 we looked at battery electric cars. This week it’s time for another type of electric car – solar-powered cars. 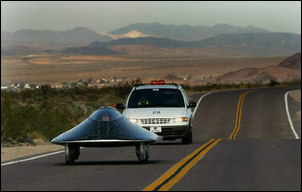 Solar-powered cars have become well known through long-distance solar races. One of the best known is the Darwin – Adelaide race held in Australia. The wonderfully high tech cars streak through the Outback at speeds of up to 130 km/h, apparently demonstrating that solar-powered cars will shortly be in everyone’s driveways. So what promise do cars powered by the sun actually have? A solar car can use a variety of ways of converting the sun’s energy into forward motion. For example, a solar car can use parabolic reflectors to concentrate the sun’s rays onto a collector that contains water, so heating it sufficiently to obtain steam under pressure. 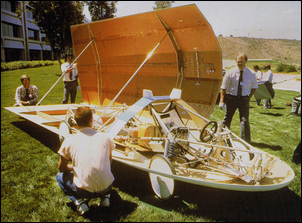 The steam can drive a turbine or reciprocating engine – making it a solar/steam car. However, the most successful solar cars have used photo-voltaic (solar) cells to convert the sun’s energy into electrical power. 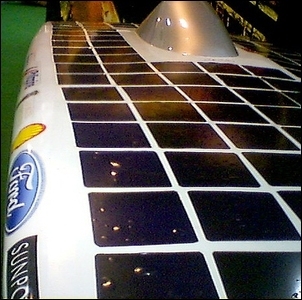 Solar cells are placed all over the car’s body so that they can receive the maximum amount of solar insolation, even when the sun is low in the sky. In some cases, the solar cells are placed on panels that can be aimed at the sun. The power generated by the solar cells is stored in a battery; the battery powers a very efficient electric motor that drives the wheels. Sophisticated electronic controls manage the solar cell output and motor speed drive in order that highest possible efficiencies are maintained. Streamlined body shapes are used to reduce aerodynamic drag to a practical minimum. Narrow, low rolling resistance tyres are fitted and parasitic bearing drag is also minimised. The cars are also kept as light in weight as possible, reducing both rolling drag (a little) and the power required to climb hills at speed (a lot). 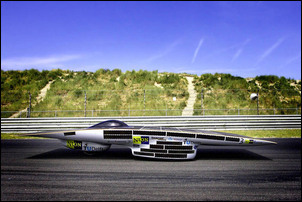 The Nuna III, built by students of the Delft University of Technology in The Netherlands, won the last Darwin – Adelaide solar race. It is 5 metres long, 8 metres wide and just 0.8 metres high. The solars cells that cover its surface have an efficiency of 26 percent and power an electric motor rated at 2.4kW. The battery has a capacity of 5kWh and weighs 30kg. The body’s drag co-efficient is a stunning 0.07. Solar power is available anywhere the sun shines. It is non-polluting, doesn’t make any noise and doesn’t smell. Solar power technologies are well accepted and viewed positively by the public (eg solar-powered electronic devices like calculators and watches; household solar water heating). Solar power also has a very significant advantage – it is free. However, the disadvantages of solar powered cars are manifest. If a car has a plan area of (say) 8 square metres, at best a power of 8kW is available. If the solar cells have an efficiency of 25 per cent (which is very good for solar cells), then the maximum power available is 2kW. As the solar race cars show, a very tricky car can get along quite well with these sorts of power levels. But only when you’re located in just the right place and the sun is shining! Because a large area of solar cells is needed, you can’t even build a single seat, tiny and lightweight car that actually could be used with only a few kilowatts of power available to drive it. It’s very unlikely that solar-powered cars will ever be viable. If solar cell efficiency increased by an amazing amount (eg it rose to 80 per cent), a very small, lightweight personal car could be developed – one more akin to a human powered vehicle in design and construction than a traditional car. However, even with this massive improvement in solar cell efficiency, such a car would not be able to equal the performance and practicality of current cars – there just isn’t enough energy available in the small area in which it can be collected, and the availability of that energy is not sufficiently continuous. Unless solar cell efficiency skyrockets, forget solar cars – and even if solar cell efficiency did radically improve, solar-powered cars would still be very specialised daytime personal transport vehicles only.